House MD Episode Guide: Season One #111 "Detox"
First Season Episodes :: #111 "Detox"
so click on the "Search Button" above to search for "111" (also see below). 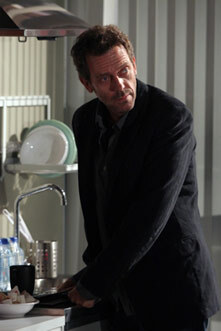 Dr. Gregory House (Hugh Laurie) struggles with a vicodin dependency in the episode "Detox". A 16 year-old (Keith) whose girlfriend crashed his father's Porsche when she saw that he was bleeding. Naphthalene poisoning caused by termites in the walls of the house the patient lived in. It was made worse in the hospital because the patient didn't eat and so his fat cells were used for fuel and thus the poison stored in them was released into the body. Cuddy tries to get House to admit he has a problem with the Vicodin by offering a month off a clinic duty if he will stay a week off the Vicodin so while trying to solve this case, House is going through withdrawal symptons. Also check out the Television Without Pity recap of this episode. House: "I take risks, sometimes patients die. But not taking risks causes more patients to die, so I guess my biggest problem is I've been cursed with the ability to do the math." Wilson (at the end of the episode): "You learn anything?" House: "Yeah, I'm an addict." Wilson: "There are programs. Cuddy would give you the time. You could get on a different pain management regimen---"
House: "I don't need to stop." House: "I said I was an addict. I didn't say I had a problem. I pay my bills, I make my meals. I function." Wilson: "Is that all you want? You have no relationships." House: "I don't want any relationships." House: "I've been alienating people since I was three." Wilson: "Oh, come on! Drop it! You don't think you've changed in the last few years?" House: "Well, of, of course I have. I've gotten older. My hair's gotten thinner. Sometimes I'm bored, sometimes I'm lonely, sometimes I wonder what it all means." Wilson: "No, I was there! You are not just a regular guy who's getting older, you've changed! You're miserable, and you're afraid to face yourself---"
House: "Of course I've changed!" Wilson: "And everything's the leg? Nothing's the pills? They haven't done a thing to you?" House: "They let me do my job, and they take away my pain."